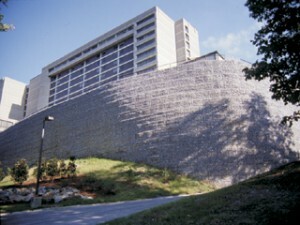 Gabions are wire containers, uniformly partitioned, of variable size, interconnected with other similar containers and filled with stone at the site of use, to form flexible, permeable, monolithic structures such as retaining walls, sea walls, channel linings, revetments and weirs for earth retention. Gabion structures yield to earth movement but maintain full efficiency and remain structurally sound. They are quite unlike rigid or sem-rigid structures which may suffer catastrophic failure when even slight changes occur in their foundations. Highly permeable, the gabion structures act as self draining units which “bleed” off ground waters, relieving hydrostatic heads. Interstitial spaces in the rock fill dissipate the energy of flood currents and wave action. Efficiency in gabion structures, rather than decreasing with age, actually increases. During early periods of use, silt and vegetation will collect with the rock fill to form a naturally permanent structure and may be used to remove solid pollutants or “floatables” from the water. Gabions and mattresses may be purchased as as assembled baskets, or in rollstock form. Rollstock may utilized to build continuous gabion structures up to 300 feet in length. Our engineered welded wire mesh products are used in a variety of applications including: earth retention and soil stabilization, erosion and flood control, landscape and architectural applications.